Cross-country racer Bruce Garland is set for a start as the 28th Australasian Safari gets underway, with seven days of desert racing competition in Western Australia. 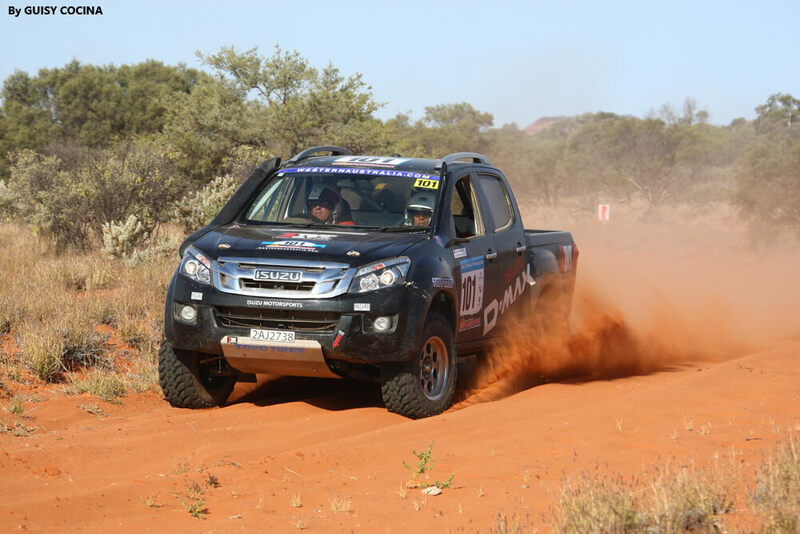 In previous runs of the West Australian outback enduro, Garland and long-time navigator Harry Suzuki have raced a high performance 'Dakar spec' Isuzu D-MAX, but this year they have entered a different class, with an almost showroom-spec version of the popular utility. "We've entered the T2 international class which is for 4WD vehicles with limited modifications," Garland says. "It's essentially for stock-standard vehicles with some shock absorber changes and the addition of the required safety equipment, nothing more than that. "We won't be challenging the rocket ships at the front of the field as we have in the past. At this point the plan is to keep out of trouble, be consistent and reliable and do the best we can. "We'll worry about what's possible in terms of results a little later in the week, once we see what the event has in store for us! 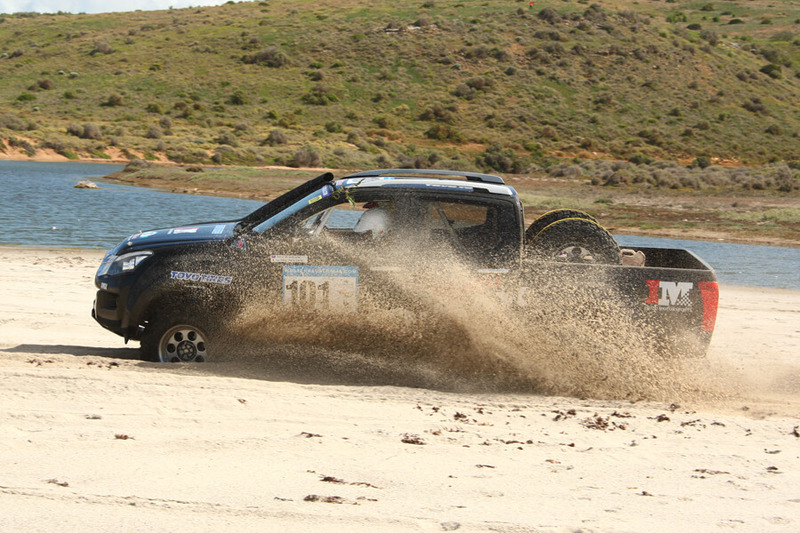 The 2013 Australasian Safari kicked off with a ceremonial start in Perth before competitors made their way 220km north to Jurien Bay, heart of the WA crayfish industry, for the 6.85km Prologue to determine starting order. The event will travel further north to Geraldton, then up into the Gascoyne region and around the Kennedy Ranges before heading out to tropical Carnarvon. Competitors then head south again through Kalbarri before finishing in Geraldton next Friday, September 27. Total distance is around 3200km. Garland and Suzuki are contesting the event for the 17th time, and have won it five times. 'Taking it easy' is cross-country rally star Bruce Garland's approach to the first few days of the 2013 Australasian Safari. Garland and co-driver Harry Suzuki are sitting in 17th outright of the 23 auto competitors after Leg One of the seven-day enduro in the West Australian outback. Yesterday provided competitors with sand traps, tricky twisting navigation and rugged terrain in three stages in and around Northampton and Kalbarri, around 600km north of Perth. "You don't win an event like this on Day One," says Garland. "We're taking it easy, just pacing ourselves. The first stage was on the beach so that was fairly easy, but then we were in and out of the Murchison River and it was very hard and 'bony'. "The car's going well and I'm going well. It's a very different car to drive to our usual Isuzu D-MAX, so we're just settling into it. We'll pick up the pace when we're ready, after we do a few more adjustments to the brakes, the suspension and the driver!" 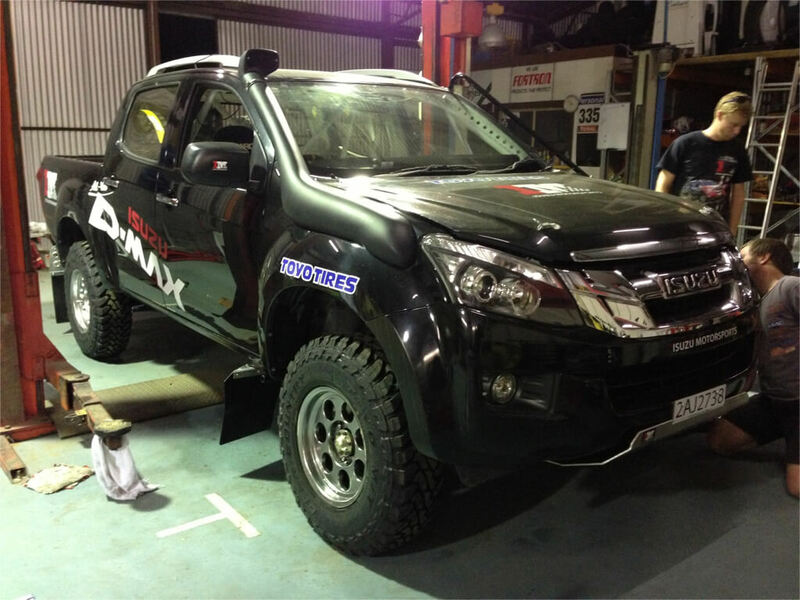 Historically, the Sydney-based crew use the Safari as a testing ground for the Dakar Rally, but with Dakar not on their program for 2014, they have entered an almost stock-standard D-MAX rather than their usual high-powered 'Dakar spec' vehicle. They are competing in the international T2 class that is for 4WD vehicles with minor modifications, basically limited to some shock absorber changes and the fitting of required safety equipment. The 2013 Australasian Safari is in its 28th year. It kicked off with a ceremonial start in Perth and will finish in Geraldton this Friday, September 27, after travelling around 3200km. Yesterday's racing travelled through farm paddocks, along the edge of the Bowes River, into Yandi Station and across the Vermin Proof Fence and into rough, rugged and rocky terrain on Coolcalalaya Station. Competitors crossed Murchison River and finished up at Mary Springs Station. Today, competitors will tackle two long stages of 147km and 288km respectively, heading to Gascoyne Junction, a small town inland from Carnarvon (900km north of Perth) on the junction of the Gascoyne River and Lyons River. At the 2006 census, Gascoyne Junction had a population of 149. It's a centre for mining, pastoral and desert merino fine wool industries. Garland and Suzuki are contesting the seven-day endurance race for the 17th time, and have won it five times. A huge day of racing marked Day Two of the 2013 Australasian Safari – and a move up the field for Bruce Garland and Harry Suzuki. The veteran cross-country rally crew has improved from 17th to 12th outright of the 23 auto competitors after Leg Two of the seven-day West Australian enduro. 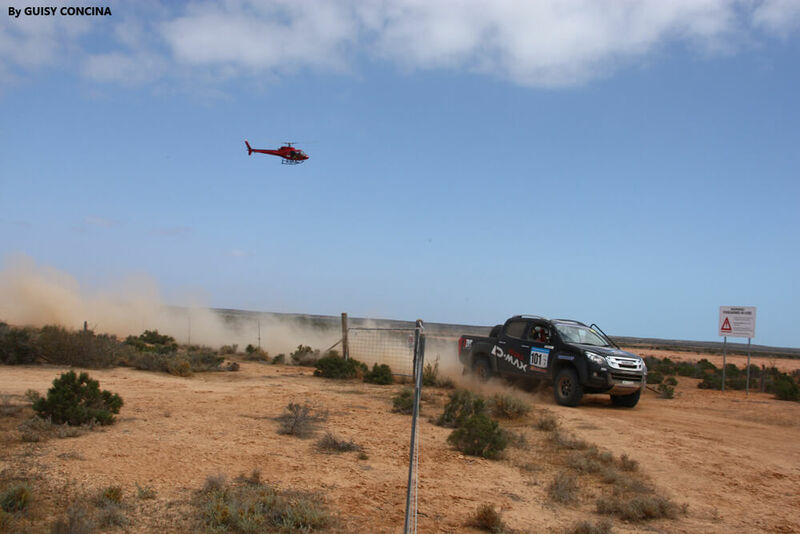 Three stages totalling 667km took the competitors from Kalbarri to Gascoyne Junction, and the day was not without incident – several competitors came unstuck in the conditions including long-time Garland rival, KeesWeel. He and co-driver John Panozzo walked away with minor injuries after hitting ruts in the third stage and barrel-rolling their Holden Colorado. Leg Two began with 50km of well-travelled coastal tracks heading north, which in places were rough, sandy and rocky. It changed to low scrub coastal country including NerrinNerrin and Coburn Stations. The first stage finished with a rally-type road known as 'Snake Road' heading into the Hamelin Service Area. In Stage Two competitors tackled sandy tracks, rough and rocky patches, low swamp fences, fence lines and 'mill runs' through Hamelin, Carbla, Yaringa and Wooramel Stations. Stage Three provided more twist and turns then dune country into Jimba Jimba Station, finishing up with a mixed bag of tight twisty tracks, narrow fence tracks and low creek country. Garland always says an enduro race is not won in the first few days and yesterday was a perfect example of the 'slow and steady' battle plan in action. Rather than their usual high-performance 'Dakar-spec' Isuzu D-MAX, the duo is driving an almost stock-standard D-MAX in the international T2 class. It covers 4WD vehicles with minor modifications, basically limited to some shock absorber changes and the fitting of required safety equipment. Today's racing (Leg Three) consists of two stages, one of 147.15km and the second of 288.64m, for a loop around Gascoyne Junction, a small town inland from Carnarvon (900km north of Perth) on the junction of the Gascoyne River and Lyons River. At the 2006 census, Gascoyne Junction had a population of 149. Garland and Suzuki are due to start at 8.49am WA time (10.49am, Eastern Australian time). They are contesting the seven-day endurance race for the 17th time, and have won it five times. As the 2013 Australasian Safari reaches its midpoint, wily cross-country racer Bruce Garland continues his 'slow but steady' campaign. The rally is living up to its reputation as Australia's toughest off-road motorsport event, with many competitors being slowed by the rough conditions. "A lot of people have been having multiple punctures because it's so rough out there, but not us," says Garland. Western Australia's Gascoyne region was the scene for 432km of hard competitive racing yesterday, two stages over and through the area's red earth, rugged ranges and rock formations and dry creek beds. Leg Three circumnavigated the vast Bidgemia and Gascoyne Stations, and included fast-flowing rally roads and flood-damaged river plains. After a spectacular crossing of the Gascoyne River, competitors tackled rocky ranges, gutters and rough creeks that forced them to pay close attention to the road book. "It was a really long day but the scenery was spectacular – when we had time to look at it!" says Garland. "There are lots of wildflowers in bloom so there were parts where it was very picturesque, but we really didn't have time for too much sight-seeing because you really have to have the brain switched on in this event. "The D-MAX is great, going really well, and the driver is getting better every day! Lots of crews in front of us are having issues with the conditions but we just keep ticking. "It's a bit of a waiting game on an event like this. We don't have the outright power of the guys running at the front but many of them are pushing too hard in the conditions and that's when you can come unstuck. We'll pick up the pace a bit now and see where we finish." Garland and long-time navigator Harry Suzuki usually tackle the Safari in a high-powered 'Dakar-spec' Isuzu D-MAX but this year the duo is driving an almost stock-standard variant. With around 20 per cent more power and torque (156kW; 456Nm) than the showroom model, the ute is competing in the international T2 class that covers 4WD vehicles with some minor modifications. It currently sits 12th outright in the auto category. Today's racing (Leg Four) will take competitors from Gascoyne Junction to the town of Carnarvon, where the Gascoyne River meets the Indian Ocean. Nine hundred kilometres north of Perth, Carnarvon is known as WA's fruit bowl and is famous for its banana plantations. It's also the gateway to the world-renowned Ningaloo Reef. Competitors will tackle two stages, one of 132.78km and one of 155.85km. 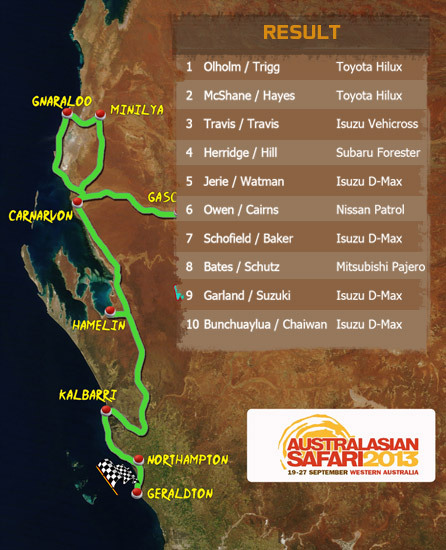 The 2013 Australasian Safari is in its 28th year. It kicked off with a ceremonial start in Perth and will finish in Geraldton this Friday, September 27, after travelling around 3200km. Garland and Suzuki are contesting the seven-day endurance race for the 17th time, and have won it five times. Cross country racer Bruce Garland has reached the top 10 as the 2013 Australasian Safari notches up its fourth day of competition. The Sydney-based veteran and long-time navigator Harry Suzuki gained two places to 10th outright yesterday after 289km of outback racing between Gascoyne Junction and the town of Carnarvon, 900km north of Perth. According to event organisers, most competitors found the first stage, which was a rough rocky crossing of the Gascoyne River and a run along the western edge of the Kennedy Ranges, a huge challenge. The second stage was hard and fast, forcing riders and drivers to tackle demanding red sand dunes before hitting some traditional Safari country with fence to fence tracks, well runs, windmills, tanks and wide open clay pans demanding accurate navigation. Garland agrees with both descriptions, but says his nearly stock-standard Isuzu D-MAX ute, coped admirably with the conditions. "The car is working better and better by the day, and the driver is getting better at driving it! 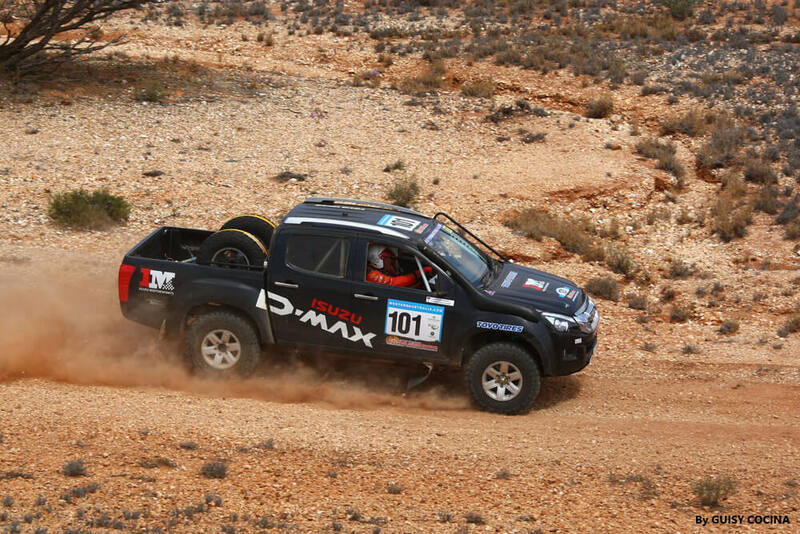 It's certainly a different kettle of fish to our Dakar D-MAX and it has taken me a bit of time to get used to it, but it is really nice to drive. "There is some lovely country around here – when you get time to have a quick look – but the conditions are really trying. A lot of people are pushing too hard for what they are up against, and they're getting lots of punctures or finding things are starting to break because of the wear and tear. "I'm not into making wild predictions, but I think we can gain a few more places before the end of the event. That's what we're aiming for." Today's racing is made up of three stages – 200km, 141.21km and 79.41km – before the event begins making its way south again, to finish at Geraldton on Friday, after covering nearly 3200km of outback Western Australia. The D-MAX Garland and Suzuki are driving is almost a showroom variant. It has around 20 per cent more power and torque (156kW; 456Nm) than the standard model and is entered in the international T2 class that covers 4WD vehicles with some minor modifications. The 2013 Australasian Safari is in its 28th year. Garland and Suzuki are contesting the seven-day endurance race for the 17th time, and have won it five times. Cross-country racing crew Bruce Garland and Harry Suzuki are shocked and saddened by the loss of a motorbike rider competing in the 2013 Australasian Safari. The accident happened on the first stage of the day, around 11.33am eastern Australian time. Despite the immediate intervention of emergency services, the competitor died at the scene as a result of his injuries. The day's competition was cancelled as a result. "He was a terrific bloke who we've known around the different off-road races in Australia for at least five years, probably longer," says Bruce. "He was having a great time on the event and we were only having a laugh and a chat with him last night at the bivouac in Carnarvon, so we're finding it very hard to believe he's gone. "While we all love this sport, we also know it is dangerous and these things can happen, but when they do, it's like losing a member of our own family. "Harry and I would like to pass on our sincere condolences to his family and friends. "We would also like it to be known that the organisers of the Australasian Safari and their medical crew did their very best to take care of him." Cross-country racer Bruce Garland is in ninth outright as the 2013 Australasian Safari draws to a close. 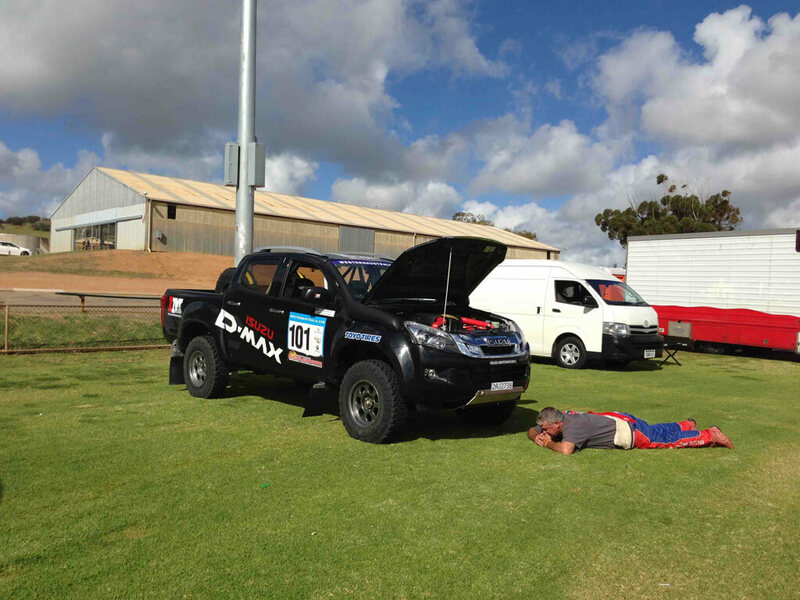 Isuzu rally team gained another place yesterday after 466km of racing between Carnarvon and Kalbarri, 592km north of Perth. The day's racing was a subdued affair, as competitors and organisers came to terms with the loss of a popular member of the Safari 'family' the previous day. Motorbike rider Ivan Erceg died in a crash on the first stage of Day Five, just hours after he had been laughing and talking with the Isuzu D-MAX duo who have known him for several years. Organisers reduced yesterday's competition by one stage for the moto riders, many of whom wore black armbands, but the auto category did the two sections as originally planned. In the first stage, which covered 260km, autos and side-by-sides tackled cattle station country with fast fence lines. The route became progressively rougher before winding up on rally-style roads through Hamelin Station. On Stage Two, where all competitors raced, the course took in the soft white sand coastline along Murchison Station, and the western side of the Murchison River. Today is the final leg and competitors will be bringing it home to Geraldton. They will be racing in three short stages (17.82km, 23.22km and 33.08km for a final total for the week of 3200km) before the ceremonial finish on the foreshores at Geraldton. 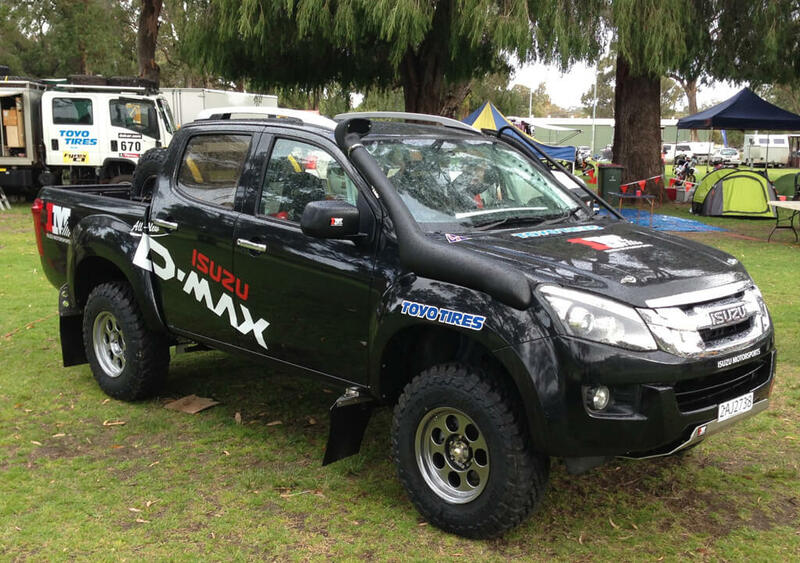 The D-MAX Garland and Suzuki are driving is almost a showroom variant, rather than the high performance 'Dakar spec' racing ute they usually compete with. It has around 20 per cent more power and torque (156kW; 456Nm) than the standard model and is entered in the international T2 class that covers 4WD vehicles with some minor modifications. "This D-MAX has been fantastic all through the event – it's very strong," Garland says. "Yesterday was punishing, but it was excellent. Didn't miss a beat. It has taken me a little while to come to terms with driving it because it is different to our Dakar cars, but I'm very impressed with the way it has performed." 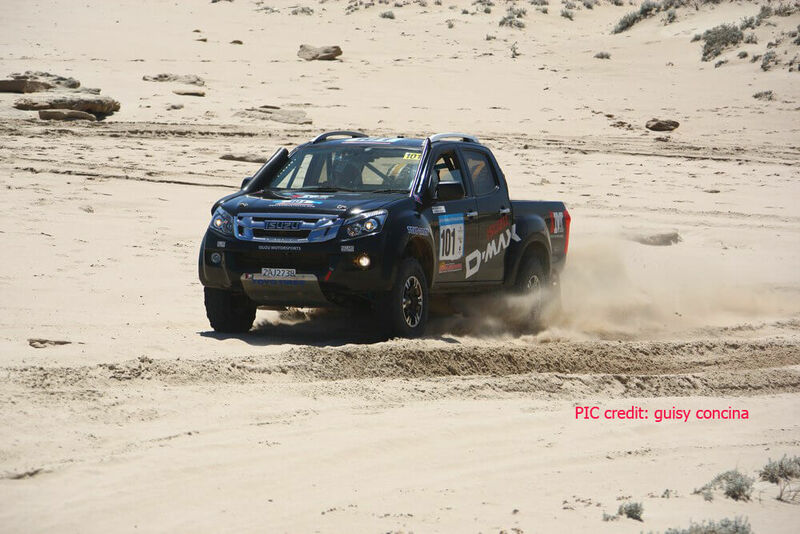 Cross-country race star Bruce Garland says both he and his showroom Isuzu D-MAX are better and stronger at the end of the 2013 Australasian Safari than they were at the start. Yesterday's final leg of the gruelling West Australian outback enduro saw competitors tackle three stages with a variety of conditions including a beach blast, farmland with sharp rocky tracks, steep beach descents and a fast run through sheep paddocks, with crests, gutters, ruts and creeks all creating hazards. Competitors finished on the edge of the Indian Ocean at Geraldton, 424km north of Perth, where the event began seven days ago. As the Safari came to a close, competing motorcycle riders formed a guard of honour and waited while the bike number and race card of their friend Ivan Erceg was formally delivered through the finish line by a friend and fellow competitor. Mr Erceg died three days ago in a crash on the first stage of Leg Five. 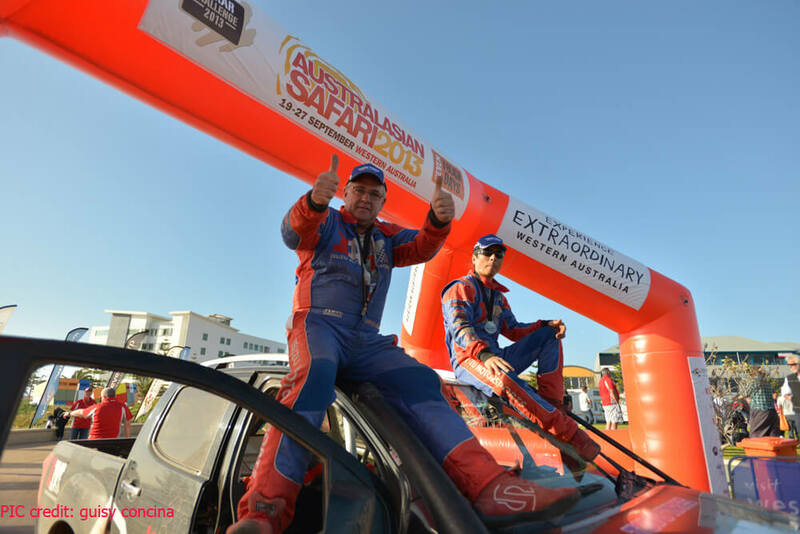 While still saddened at the loss of someone he considered a good mate in the sport, Garland is elated to have had a strong finish in the event and says this year's Safari proved just how tough and reliable the Isuzu product range is. "There were five Isuzus in the top 10, three class wins and one that was first diesel home and third outright – sadly not us this time around, but we are very happy with our result. "This was a brand-new vehicle at the start, never raced before, and it was sensational all week, super-strong and super-reliable. 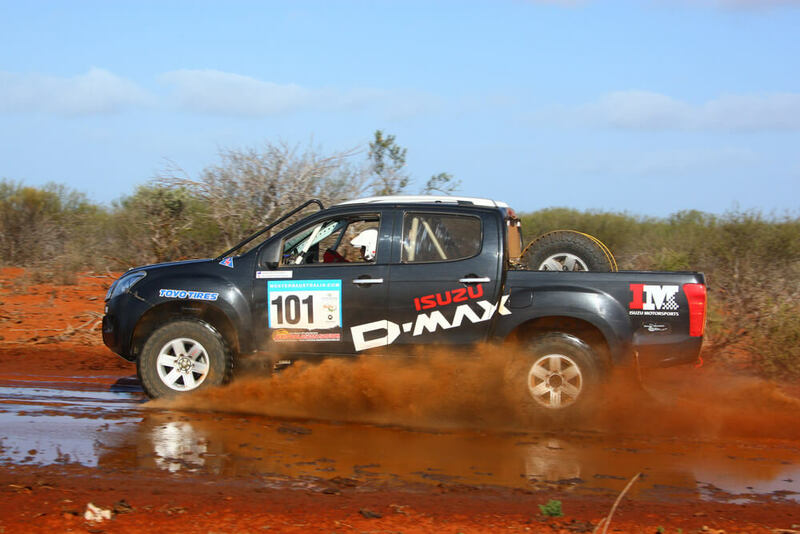 Isuzu Rally team, Garland and navigator Harry Suzuki finished ninth outright after 3200km of hard racing. The D-MAX they drove was almost a showroom variant, rather than the high performance 'Dakar spec' racing ute they usually compete with. It has around 20 per cent more power and torque (156kW; 456Nm) than the standard model and topped the international T2 class that covers 4WD vehicles with some minor modifications, but was never in outright honours contention. "I really do think it was better at the end of the event than it was at the start, but that's because the engine is well and truly run in," Garland says. "It has been a great event and very well run as usual. The Safari team always does an amazing job. This week would have been really tough for them – it has been for everyone. The 2013 Australasian Safari was the 28th running of the event. It was the 17th time Garland and Suzuki have entered it. They have won it five times.